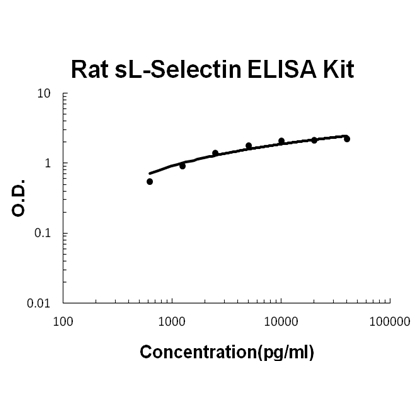 Sandwich High Sensitivity ELISA kit for Quantitative Detection of Rat sL-Selectin. 96wells/kit, with removable strips. Cell surface adhesion protein. Mediates the adherence of lymphocytes to endothelial cells of high endothelial venules in peripheral lymph nodes. Promotes initial tethering and rolling of leukocytes in endothelia. .
L-selectin, also known as CD62L, is a cell adhesion molecule found on leukocytes. It belongs to the selectin family of proteins, which recognize sialylated carbohydrate groups. It is cleaved by ADAM17.SELL(L-selectin) is a cell surface component that is a member of a family of adhesion/homing receptors which play important roles in leukocyte-endothelial cell interactions. The molecule is composed of multiple domains: one homologous to lectins, one to epidermal growth factor, and two to the consensus repeat units found in C3/C4 binding proteins.1 L-selectin acts as a "homing receptor" for leukocytes to enter secondary lymphoid tissues via high endothelial venules. Ligands present on endothelial cells will bind to leukocyte expressing L-selectin, slowing leukocyte trafficking through the blood, and facilitating entry into a secondary lymphoid organ at that point2.